This blog is a forum to highlight, celebrate and share the good works of people and organizations making our world a better place, especially those who are dedicated to catching the hurtful stones we are prone to cast at, or throw in the path of, the marginalized, vulnerable and victimized among us. Be a stonecatcher! "Mentoring can happen in any moment, whether it is during a simple conversation or going to an event together. ArtsMentors invites you to conversations and performances to have your mentorship moments at the Autorino Center for the Arts." Its an opportunity to nurture your relationship and forge new ones. ArtsMentors is a creation of Steven Raider-Ginsberg, Director of the Autorino Center at the University of Saint Joseph (USJ) and co-founder of Hartford's avant-garde Hartbeat Ensemble. The program "is designed to increase the number of quality mentoring relationships" with the express purpose of expanding the capacity of existing youth programs. 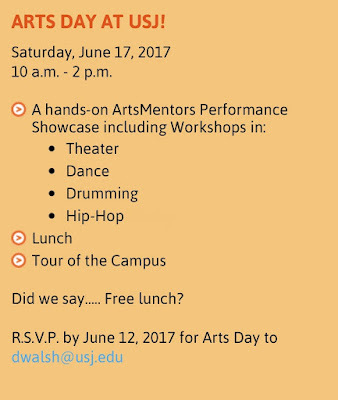 On June 17 ArtsMentors launches its first full season of innovative hands-on programs at USJ during its annual Arts Day where participants will have a special opportunity to take part in hands-on art making designed to serve 100 mentor/mentee pairs. The day will include four rotating arts workshops, lunch and a tour of the USJ campus. During the inaugural season, participants will be invited to attend four live events at the Autorio Center. Before each performance participants will have an opportunity to meet the artists and experts in the performing genre. This activity prepares them to consider a "Guiding Question" intended to focus their thoughts, as well as provide background context for each performance's themes. Bone Hill: The Concert, a dramatic musical work inspired by Martha Redbone's family lineage and her return to the Harlan County, KY coal-country of the Appalachian Mountains. Guiding Questions: "Where do the cultures in my community originate and what are the personal stories?" 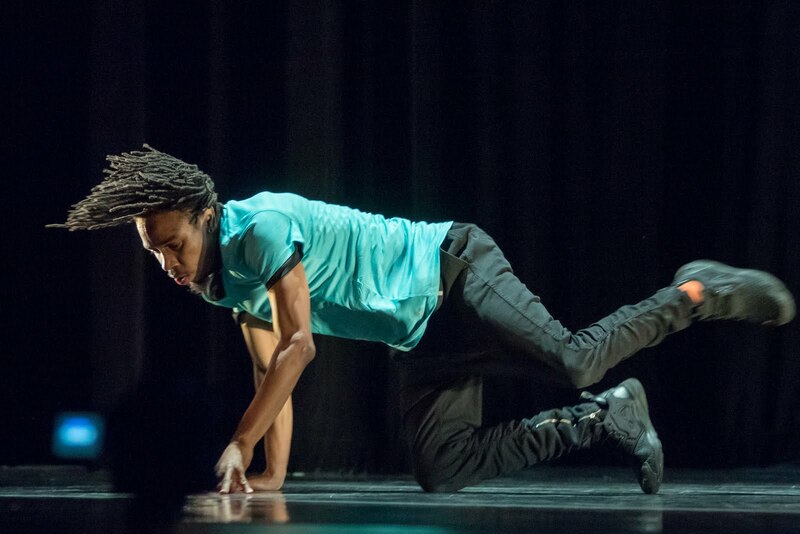 Point of Interest, Raphael Xavier's "new program repertoire built from solo, duets, and trios over the past fours years that culminates is a classically constructed quintet [exploring] the sustainability of a highly physical dance form associated with youth." Guiding Question: "How do we use the energy and vitality of our youth to age, develop and contribute to society in a positive way?" 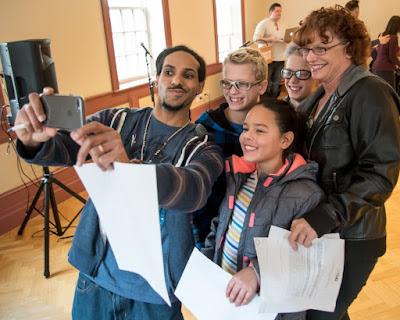 PEP Talk, Hand2Mouth Theater presented its "interactive theatrical presentation of coaches, teams and everyday heroes that combine the bravado of Muhammad Ali and the gravitas of Vince Lombardi." 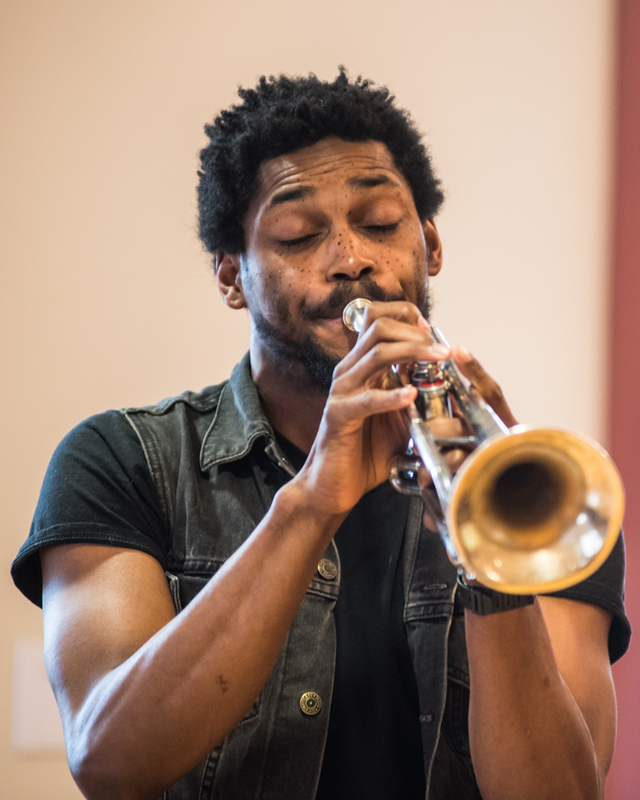 The performance created an art/sport atmosphere that inspired audiences to reflect on the past, cheer the present, and step from passive observers to active participants. Guiding Question: "What are the outcomes of positive speaking and positive thought? How do we accomplish what we think is unachievable?" 5X5 Dance Festival, one of Connecticut's "most important dance events, featured interaction, performances, and master classes between professional and collegiate dancers." Guiding question: "What are the various contemporary dance forms?" 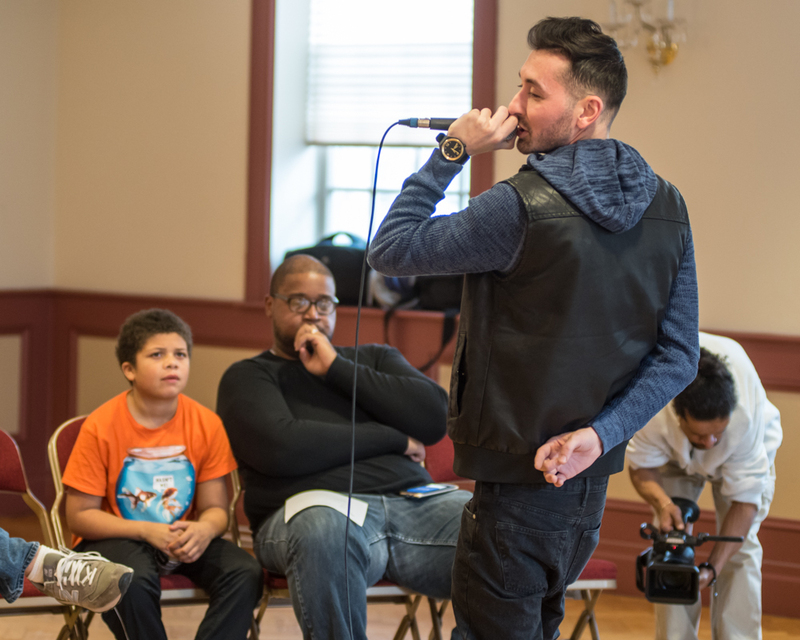 ArtsMentors provides a dynamic and creative program to develop and enhance youth and mentor relationships. And its FREE! 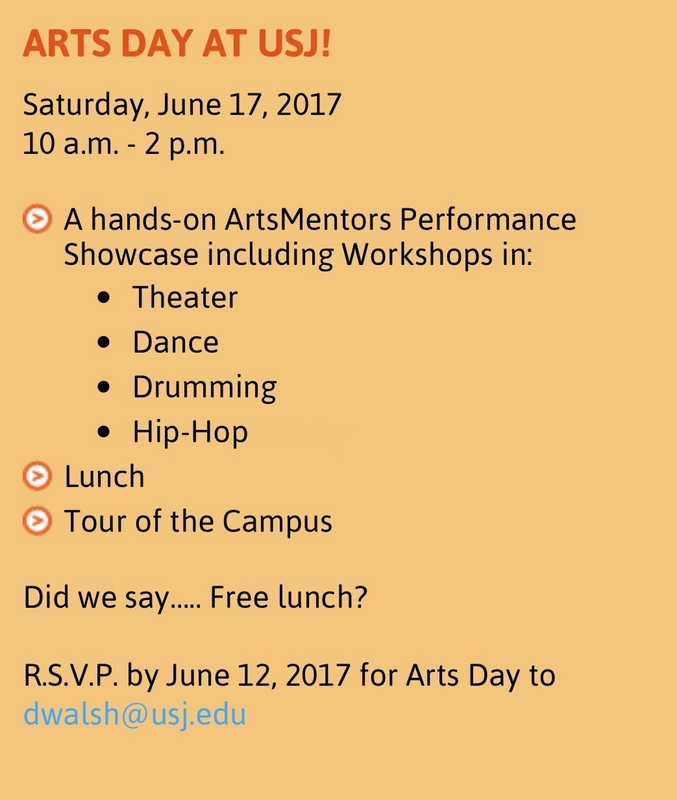 All who are interested should contact ArtsMentors Program Director Debra Walsh at dwalsh@usj.edu right away. ArtsMentors is an innovative opportunity not to be missed. Blog post source text and quotations courtesy of Steven Raider-Ginsberg and Debra Walsh. Photos by Andy Hart provided courtesy of Steven Raider-Ginsberg. 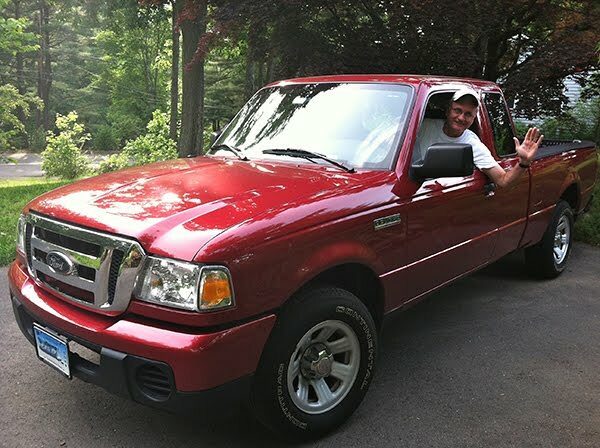 I drive a red truck. I want to catch stones. This blog is a forum to highlight, celebrate and share the good works of people and organizations making our world a better place, especially those who are dedicated to catching the hurtful stones we are prone to cast at, or throw in the path of, the marginalized, vulnerable, and victimized among us, which prevents them from realizing the recognition, respect, and rights a just world should afford everyone. Invest in each other and work together. Be a stonecatcher! Love my family; retired executive from public, private and non-profit sector careers; Hartford Area Habitat for Humanity director emeritus; Mercy Housing and Shelter Corporation trustee; Navy vet; blogger; photographer; views my own. Copyright © 2016-2018 Donald H. Shaw, Jr. Page protected by Copy Source - Do not copy. Simple theme. Powered by Blogger.